'Racist Bill'? 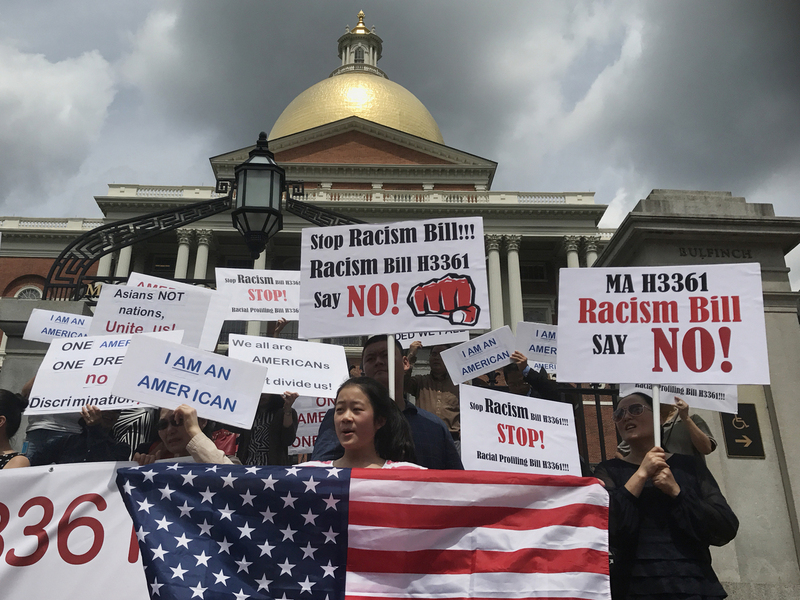 Chinese Immigrants Protest Effort To Collect More Asian-American Data Massachusetts lawmakers and supporters of the bill say collecting detailed data could help bring more resources to Asian-Americans. But some protesters worry the data will be misused. Protesters gather outside the Massachusetts State House in Boston for a July 28 demonstration against a bill that would require state agencies to collected detailed data on Asian-Americans and Pacific Islanders. Asian-Americans are an incredibly diverse group. To help capture that diversity, some states have recently passed laws requiring state agencies to collect more detailed demographic data about the country's fastest-growing racial group. Those policies have been met with a backlash from within the Asian-American community. Massachusetts state Rep. Tackey Chan, a Democrat who in January introduced a bill calling for more Asian-American data, says his office started receiving a series of phone calls and emails raising concerns about the bill last month. "To be honest with you, I was rather surprised by that," says Chan, a Democrat whose district includes Quincy, Mass., home to the second-largest Asian-American population in the state after Boston. Chan says there's little to no information at the state or local level about Asian-Americans. If passed, his bill would require state agencies in Massachusetts to identify Asian-American and Pacific Islander respondents in surveys about, for example, health, schools and employment. And that data would have to be broken down by the state's five largest Asian-American and Pacific Islander ethnic groups, such as Chinese, Indian and Vietnamese. "We are a data-driven society," he says. "It's hard to make public policy without data. And if you don't have data, you can't advocate." States including California, Minnesota and Rhode Island have passed similar laws. Lawmakers say more data can help pinpoint unmet needs that can be hard to see. On a recent Friday afternoon, about 60 protesters waved picket signs and American flags on the steps of the Massachusetts State House in Boston. Almost all of the demonstrators were immigrants from China. Many of them connected through the social media app WeChat. Linglan Zhang (right) of Lexington, Mass., holds a picket sign next to her son, Sean (left), and boyfriend, David Kates (right). "Stop the racist bill!" they chanted, referring to Chan's bill. Some held signs saying, "Aggregation, not segregation," and called for Asian-Americans to be counted only as one group rather than separated by ethnicity. "The fear is, you know, how you can guarantee the demographic data collected will not be abused or will not be misused for other purposes," said Andy Liu, a computer engineer from Sharon, Mass., who helped organize the protest. Liu and other protesters questioned why the Massachusetts bill singles out Asian-Americans and not other racial groups for additional data. "This is obviously discrimination against Asian-Americans," Linglan Zhang of Lexington, Mass., said in Mandarin. Protesters in other states have also raised that concern, according to Karthick Ramakrishnan, a political scientist at the University of California, Riverside, and a longtime advocate for more Asian-American data. Ramakrishnan has been following the organized protests and other activism against the data collection laws. He says this debate shows the divide between a new generation of Chinese immigrants and more established Asian-American groups who've been calling for more data for years. "These mainstream Asian-American organizations are nearly completely absent from the spaces where a large and growing number of Chinese immigrants are active," he says. There is no clear timeline for the Massachusetts bill, but another protest against it is set to take place in Boston later this month. Affirmative action, Ramakrishnan says, is a main issue driving this fight over data collection. He says many of the immigrants from mainland China who are protesting are worried about their children's schooling. "The belief is that by killing any kind of data collection on race, these Chinese-Americans might have a fair shot getting into Ivy League schools. That's the theory," he says. Wen Zhao, who traveled with her seven-year-old son from Westford, Mass., to attend the Boston protest, said she doesn't support the use of racial data in the selection process for schools or jobs. "They use those data in education, in college admissions and even in [the] workforce. That's not fair," said Zhao, who added she fears separating Asian-American data by ethnic groups would further divide Asian-Americans. On Monday, two dozen member organizations and supporters of the Asian Pacific Islanders Civic Action Network released a statement in support of the Massachusetts bill. The groups included the Chinese Progressive Association and the Boston Chinatown Neighborhood Center, the Boston area's largest social service provider for Asian families. Anh Vu Sawyer is the executive director of the Southeast Asian Coalition in Worcester, Mass. 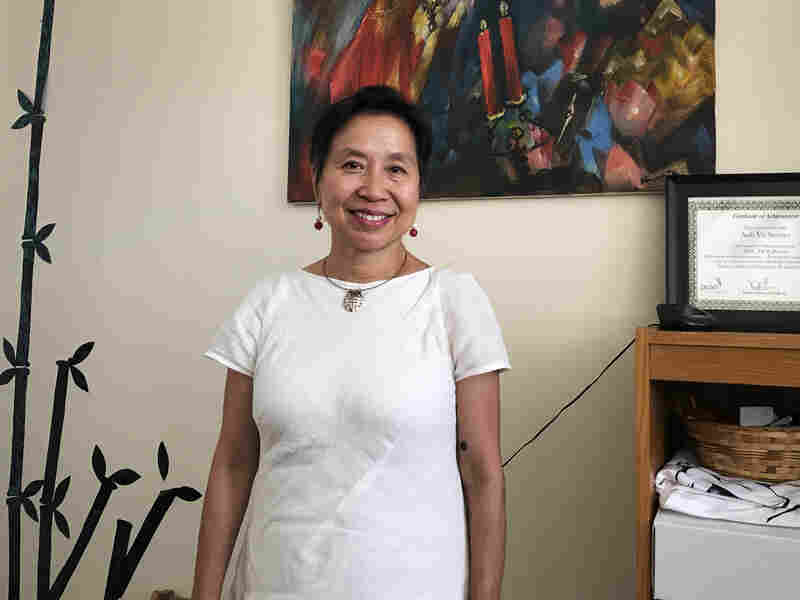 She says more detailed data on Asian-Americans could help secure more funding for services to immigrants from Vietnam, Burma and other Southeast Asian countries. "Disaggregation is not segregation," the organizations wrote. "In fact, we should be united in uplifting our community members who have been continuously calling for data disaggregation so they will not be left invisible." Anh Vu Sawyer, executive director of the Southeast Asian Coalition in Worcester, Mass., adds more detailed data about Asian-Americans could bring in more funding for services for immigrants from grant makers. "I have to have data to let them know there's a need right here. I cannot just say I observe that I have people coming in with suicide tendency or I have people with a family of five and [who] have less than $15,000 a year," Sawyer says. As a former refugee who escaped the Vietnam War, Sawyer says she understands the privacy concerns in a political climate that doesn't seem to welcome immigrants. She's also worried that disaggregated data about Asian-Americans could lead to more splits within the community because of the inevitable comparisons about socioeconomic status between ethnic groups. "This is not an easy bill," she says. "But I really believe with all my heart the reason we're doing this is so that everyone will get the help they need to be the best they can be."